Frontman Cody Carson first made a buzz on the internet playing acoustic covers of one of his favorite contemporary bands, All Time Low. 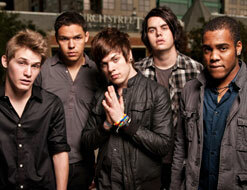 After forming Set It Off and self-releasing their second EP – 2009’s Calm Before the Storm – the response was mixed. To their great credit, they toured hard and made many, many fans on the road with their powerful live show. (Currently, 28K fans on MySpace and growing!) But haters on punk websites and blogs relentlessly slagged Set it Off for being derivative and unoriginal. Carson and the rest of Set it Off took these stinging comments to heart and eventually went back to the drawing board. Now they are back with a vengeance. From the first measures of “@Reply,” you know you’re in for something different. Orchestral strings pluck and bells chime with growing tension over atribal-esque drum beat before Carson brings it all to a brief hush with a coy “shhhhhh” and then rages back to full-volume with a blood-curdling scream. The next few minutes will bring to mind certain tones of Panic! at the Disco, and Cork Tree-era Fall Out Boy, but Set It Off – with their unique melodic sensibilities and Carson’s powerful pipes – bring it all together in an exciting and original package for maximum impact. The video, directed by Michael Patti, brings the song – and the song’s origin – to the screen in a perfectly symbolic way. In it, the members of the band are on trial in a dingy courtroom where Carson delivers his heartfelt lyrics as impassioned testimony to the lawyers, judge, and jury. Interspersed with energetic performance footage, Carson’s dramatics eventually bring his disapproving audience to his side, and at the right moment, the band busts out of the courtroom with their new fans close behind. Ending with a rooftop performance with the New York City skyline in the background, Carson sings the refrain “This is our night / This is our time / This is our chance at being alive!” “@Reply” sounds like the new anthem, and Set it Off looks like a band ready for its closeup. As the band continues to write and prepare for its second EP, the web is already abuzz about “@Reply” and the prospect of an album’s worth of songs of this caliber. The change-of-heart experienced by the jury in the video’s courtroom scenario, is already happening in the court of the internet. Former haters are quickly becoming believers in Set It Off. “I used to hate this band… Now I like very much,” wrote Iammanhattan on AltPress.com. And that about says it all. Haters can be a negative source of energy on the web, but some bands – like Set It Off – can harness that energy, convert it to inspiration, and come back twice the band they were before.